Go to Las Vegas to gamble and try to win $10 million at different casinos. Gamble in Craps, Roulette, Blackjack, Poker, and Slots. The player can choose to play either a single-player or multi-player game. 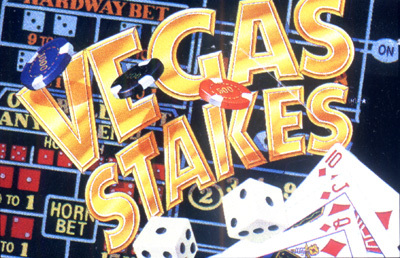 In the single-player game a computerized friend accompanies the player around the various casinos. In the multi-player game, poker cannot be played since everyone could see everyone else's cards. There are no random encounters in multi-player mode. One of the biggest draws of Vegas Stakes is the situations the player must deal with aside from the gaming tables. Essentially, players will have interactions with their traveling party and casino patrons. Some are innocent; for example, one of your friends is going to the sports book and asks if you want to place a wager. However, some can have significant positive or negative consequences. Random patrons will approach you and depending on your choices, you may wind up making (or losing) a lot of money.